For Christmas, my sister and her husband received a Gratitude Jar. Their oldest grandchild is a second grade teacher who had the idea of putting together a “Gratitude Jar” as a family gift to her grandparents. Each child, spouse and grandchild in the family was asked to name something they were grateful to my sister and her husband for. All were recorded and put on tiny white scrolls to fill the Gratitude Jar to the brim. I thought of what a wonderful gift it was for both parents to hear gratitude for the things they did right. . . There were surprises and discoveries for both my sister and brother-in-law. Who would have guessed that some of the most ordinary and logical parenting decisions, would one day be looked upon as a gift by their child? 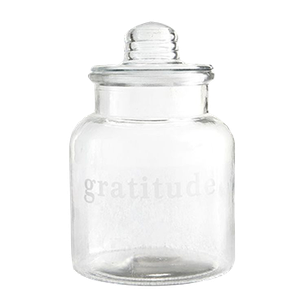 I’ve thought of the Gratitude Jar frequently since I spotted it in my brother-in-law’s hospital room. Wouldn’t it be wonderful if we all took a moment to express gratitude for people in our lives . . . To share a word on how we have been blessed by them. Some of the last words my brother-in-law heard, as he was dying, were read from a little slip of paper found in the gratitude jar. This entry was posted in Faith & Life, Family-Relationships and tagged Family-Relationships, gratitude jar, Proverbs 17:6, thanking a parent. Bookmark the permalink.